This Light Award is sponsored by 101 Best As a Man Thinketh Quotes and processed through Kiva.org. Rose is a saleswoman and chairwoman of the banque communautaire “Mafanyikiyo,” a client of MFI Hekima. She is 52 years old, married, and the mother of six children, all of whom are in school. For five years, she has been a vendor of foodstuffs in a market in the town. She is going to stock up on 60 kg of beans to increase her business. She received her first financing from her husband. She hopes to change to a more profitable business activity, as well as to school and feed her children. Finally, she thanks Hekima and its partners for their support of non-bankable entrepreneurs. It should be noted that a client is holding her baby. 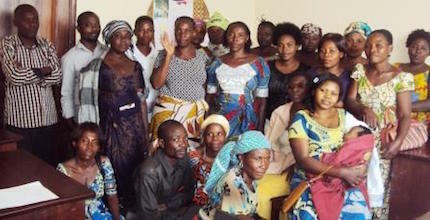 Congratulations to The Mafanyikiyo Group in the Congo!